Resistencia Feminista, organised by Front Line Defenders, Amnesty International and ARC: Thursday 27th April, @6.30. Venue TBC. Talk by Honduran Human Rights Defender Regina Fonseca. What is Latin America Week? Latin America Week is a range of conferences, meetings, workshops and cultural events around Ireland, focusing on different issues each year in April. An annual programme of educational, cultural and campaigning events on issues relating to human, social and economic rights in Latin America. LAW began as Central America Week in 1986 in order to increase the impact of many separate campaigns and events being organised by a variety of groups. It became Latin America Week after its tenth anniversary in 1996. The overall aim of LAW is to concentrate the attention of the public on Latin America for one week, so as to highlight the justice issues at stake in the region and thus to facilitate campaigning and solidarity actions between Ireland and Latin America. 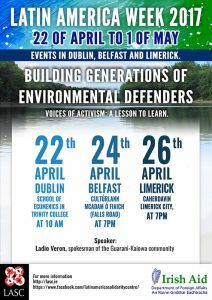 This year the Latin America Week will focus on environmental defenders and the challenges of fighting big corporations. We are happy to have with us Ladio Veron, from Brazil to talk about his experiences in the struggle for environment protection and the threats his community is facing. Ladio Veron, is chief of the Takuara community, leader of the ATY GUAÇU – general assembly of the Guarani-Kaiowa – and the spokesman of the Guarani-Kaiowa on this journey on European soil. He is a History professor, graduated from the Federal University of the Great Dourados, but he lives as a peasant in his community. The Guarani are one of the first peoples met by the Europeans when they arrived to South America 500 years ago. There are currently around 51,000 Guarani living in Brazil, divided in three groups, of which the Guarani Kaiowa is the largest. Guarani Kaiowa have been suffering threats and violence for many years. For fifty years they had been trying to recover a small piece of their ancestral land, after it was seized by a wealthy Brazilian and turned into a vast cattle ranch. Most of the forest that once covered the area had since been cleared. This was denounced by Marco Veron, Ladio’s father, in his visit to Ireland in 2000. In 2003, Marcos Veron was killed by a ranchers employees. 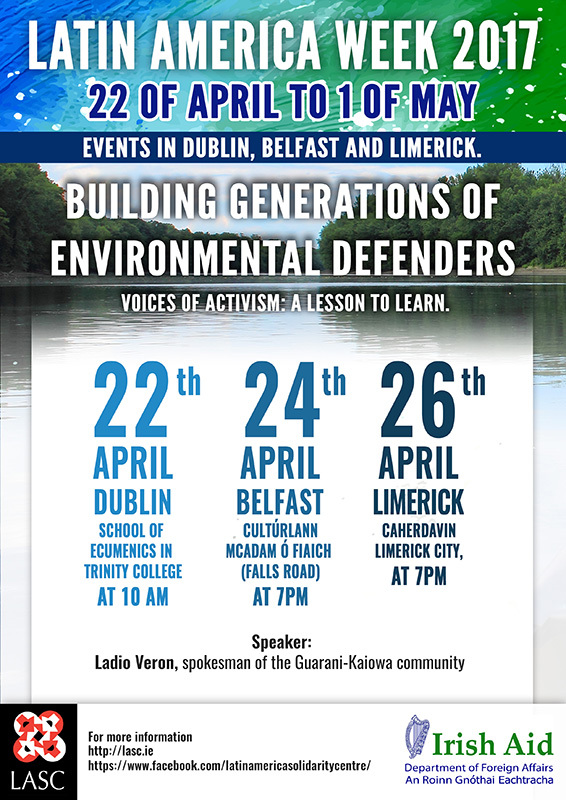 Ladio Veron now is coming to Ireland to denounce how the pressures to the Guarani Kaiowa haven’t changed. Ranchers are still invading their territory and almost all their land has been stolen. In 2015, according to data from the Indian Missionary Council (CIMI), 137 indigenous people were murdered and 36 of these cases occurred in Mato Grosso do Sul, mostly Guarani Kaiowá. With the approval of PEC 215 (Proposed Constitutional Amendment No. 215), the National Congress intends to drastically reduce indigenous territories in Brazil, which would decrease from the current 13% to 2.6%, leading to further deforestation, criminalization and murder of the native’s communities.